New moon on April 10th brought a welcome end to the bitterly cold winds which installed on the previous new moon, and at a time of year when light levels are high enough for significant growth to occur, this has been a lean month. Normally by mid April, Somerset’s many fields of grass are abundantly green and lush. This year they have been yellow, most new grass shoots frosted off every night, with any outdoor animals scrounging for whatever they can find. But now there is suddenly some warmth in air and soil, there is a lot of sowing, planting and weeding to do, and some picking too. Although it is windy…. 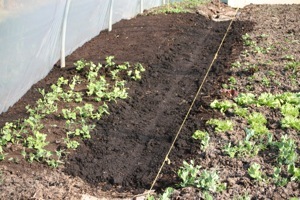 Main garden by mid April, new sowings/plantings under fleece. 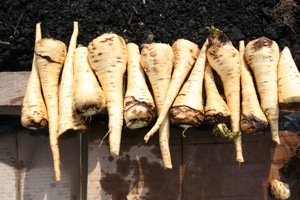 Last of the old winter roots – parsnips just washed. 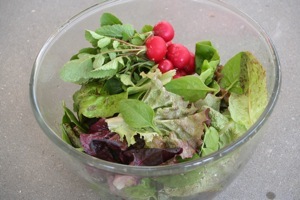 First of the spring salads, all from the fleeced, outdoor hotbed. Dibbing holes for plants on April 1st in near freezing winds. Watering plants to help them settle. Freckles lettuce, grown in modules, fresh out of the greenhouse, then fleeced. To have worthwhile growth in the garden when there is a lot of wind, especially cold winds, one needs either fleece or shelter. 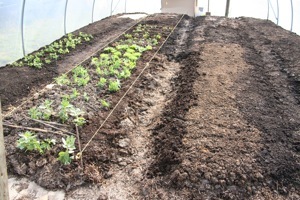 I have been hugely impressed by the survival and slow growth of small, module-raised plants which Steph and I put out on 1st April, in a ferocious north-easterly and with a temperature of 2C. 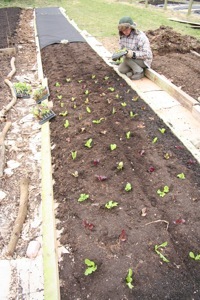 Plugs of lettuce, spinach and onions came straight out of the greenhouse, with no hardening off, and we put them into soil which had not been covered before-hand; but the beds were immediately covered with fleece which I lay flat and firm on top of their leaves, after watering plants in. 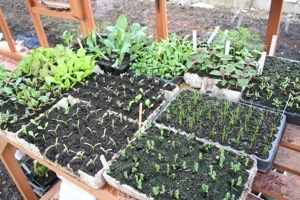 All have survived so far and are beginning to grow nicely in the milder weather. 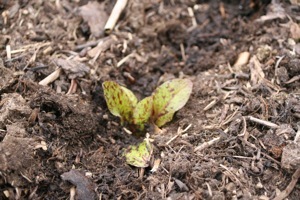 We found lots of buttercup leaves pushing up through 3 inches of compost. 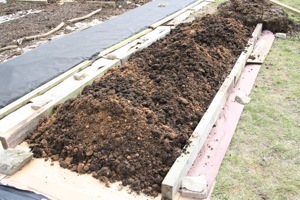 Even though the fabric had been on top, so it was time for some trowelling before planting. Steph enjoyed making pretty patterns with lettuce of many colours. 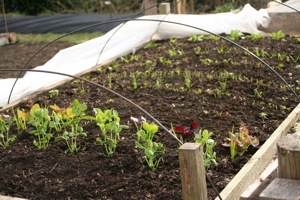 Also I planted peas for shoots, spinach, lettuce, beetroot and onions in the old chicken run. Small plants set deep again, then fleeced. The hotbeds have performed a more starring role than in a usual spring, especially the ones made in March whose heat was more able to counteract the cold Siberian air. 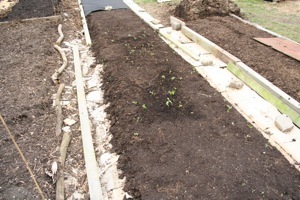 On April 13th I harvested lettuce leaves, radish and pea shoots from plantings made on March 9th, in a bed of six inches of compost which is sitting on horse manure placed there on 28th February. 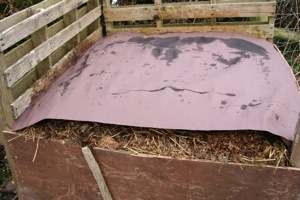 There is a cloche of fleece over the bed which has proved much easier to maintain and use for access, than the polythene lights on my first hotbed, where the eighteen inch pile of manure has also proved too shallow to maintain a worthwhile amount of heat. 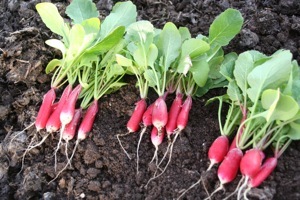 It is offering good harvests of spinach, lettuce, coriander and radish nonetheless, as in the image above. Meanwhile in the greenhouse, a hotbed filled on March 26th has maintained a steady 35C just below its surface, and I placed a pallet on it to fill with plant trays which are all growing well, with a fleece cover on when nights were frosty, as the greenhouse has not been keeping all the frost out. On April 11th I even pricked out some basil, then potted on tomatoes; Sungold are looking perky as ever and could be the first to crop by late June I hope. 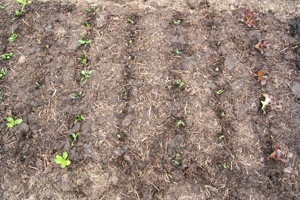 Tender plants and germinating seeds on the hotbed include tomato, cucumber, courgette and basil. 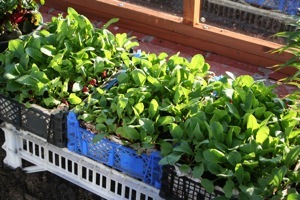 Trays are moved to an unwarmed bench where you can see peas, onions, leeks, cabbage, lettuce, tree spinach and flowers. 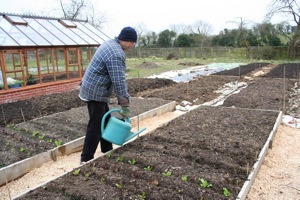 Now is time to sow many cucurbits such as cucumber, courgette, squash and melon, if you have not already. 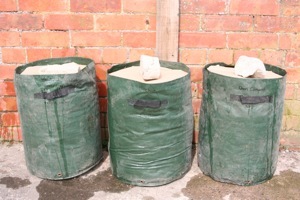 Keep the germinating seed as warm as possible, that is the most critical time for heat. 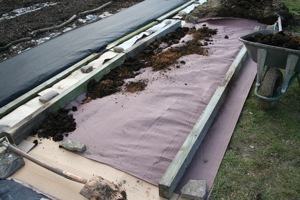 I have been putting trays of newly sown seeds under the pallet and right on top of the hotbed, where they sprout quickly, then I need to bring them back up to the light before they grow pale and leggy. 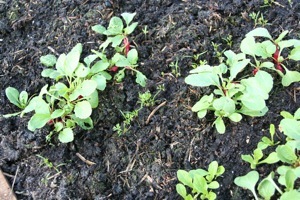 Radish growing in different composts. From left Homeacres 2 years old, pure cow manure 18 months, Lower Farm one year old. 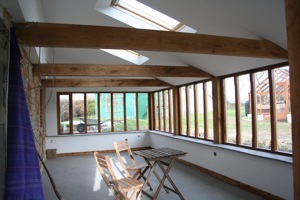 It has been an exciting time in Homeacres house with the conservatory nearing completion. 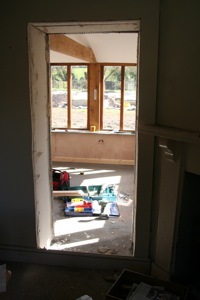 I spent an intense period painting the large ceiling as rapidly as possible, and Mark the builder was keen to press on, but I urged restraint before my course of Saturday April 13th, so he agreed to cut through the wall between conservatory and my teaching room on the following Monday. So I was surprised to hear cutting and knocking sounds on the Friday afternoon, then to see a saw blade appear through the wall into the living room. Suddenly there was an opening…. and how lovely it is. Luckily it was mild on Saturday and we could use the conservatory to look at some of the garden in the steady rain. Steph and I had a first coffee in there as the sun rose, briefly visible before clouds thickened, and next week I shall put a table and benches in there. Only snag is one can see almost the whole garden and notice everything that needs doing! My polytunnel is still more empty than I am used to at this time of year, when winter salads are usually full of new growth. 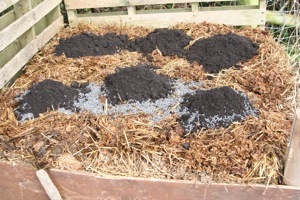 I took the opportunity to mulch again with a two inch layer of older compost for the surface of both beds and paths. 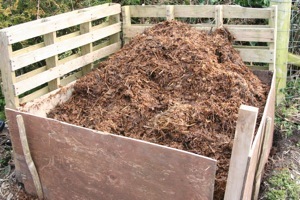 I brought the old manure in my car trailer from Lower Farm, where it is otherwise unlikely to be used. and it has made a good medium for planting into, as well as making it more difficult for celandine, buttercup, dandelion, couch grass and cow parsley to push through, although some still needs trowelling out. 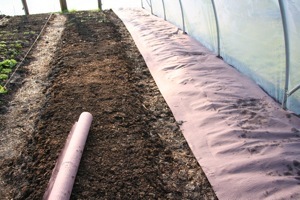 I have just planted some beetroot and red onion in the tunnel, for earlier harvests and in the case of onions to have healthier, longer-keeping bulbs. 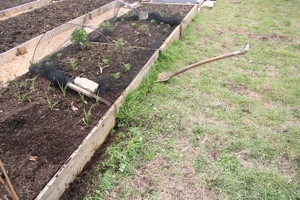 First I laid some Weedguard (thin) paper mulch against weed growth. 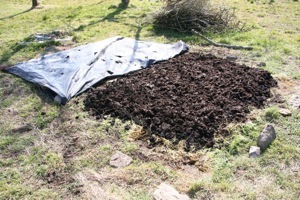 Then an inch or two of old manure & compost on top. There were patches of signigicant couch grass, dandelion, buttercup and celandine which will be weaker now. With an easier surface for planting into. 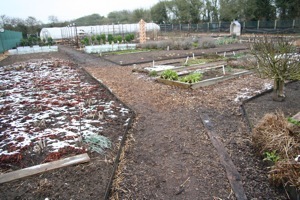 After all the second mulching was finished, with January planted salads etc. 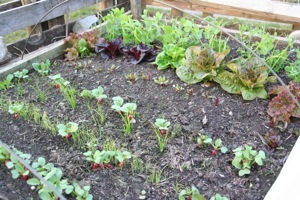 Smaller than March planted salads on the fleeced hotbed! 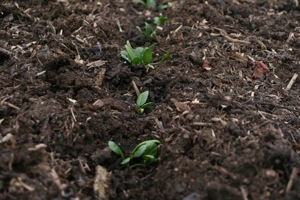 Planting potatoes just below soil level where a heap of cow manure had stood the winter. 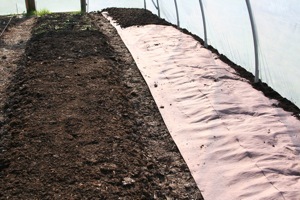 Ground then covered with old polythene. Then I changed my mind, decided there was not enough organic matter for tubers to swell in so pulled back the plastic and spread some more. Taking care to keep holes in the same place above the seed potatoes. 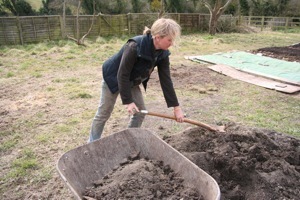 Having been sent some charcoal, I decided to set up a comparison of growing in soil enriched in Grochar, compost and minerals – here Steph is fetching some topsoil from the greenhouse trenches. 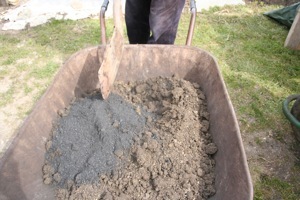 Then I am mixing volcanic lava dust, woodash, rockdust and dried seaweed meal for the first bag. 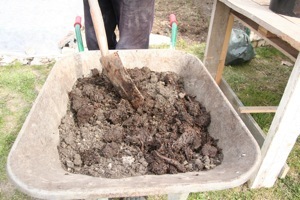 Then a load of soil is mixed with 10% Grochar. 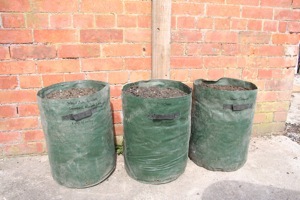 Then a third load with one quarter home made compost. Finally the sacks are placed by a wall. 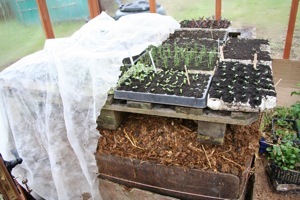 Covered with cardboard until planting courgettes in May. What a cold fortnight it has been! Not good for the supposed start to spring, with nothing growing unless in a protected space – so let’s start right there: any place where the temperature is higher. As April unfolds, there is plenty of light, the same as in August by mid month. But winter’s residual cold and winds from east or north are hampering growth more than usual this year and we need ways to convert that light into heat. 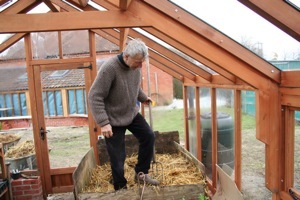 Greenhouse, polytunnel, cold frame, cloche, fleece make a world of difference when the cold east wind is blowing. Time for a chat with Colum Pawson and Patrick Whitefield. 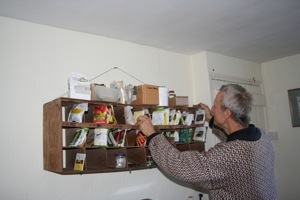 Wondering what seeds to sow in the cold weather. 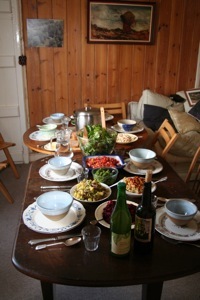 Steph’s course lunches at Homeacres are a vegetable feast, including a pesto of wild garlic, a hummus of beetroot, orange and tahini. 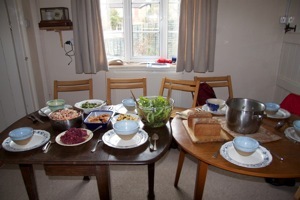 Soups with stinging nettle and parsnip, bread from fresh ground spelt flour and plenty of fresh salad leaves. 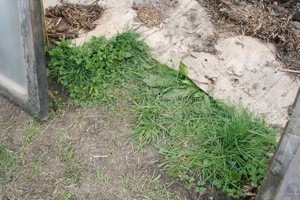 Weeds also like growing in protected spaces and where cardboard stops at the polytunnel doorway, there is a night-and-day difference between clean(ing) soil and pasture. 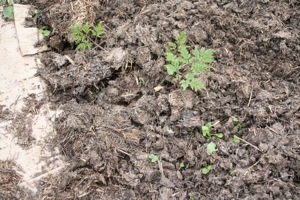 Inside some weeds are pushing through the mulch – cow parsley and celandine on the right, , I have trowelled the stems out, roots still there. 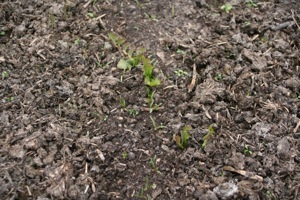 Here is dandelion between emerging carrots. 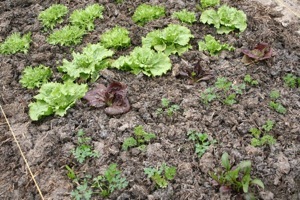 The salads planted in January on freshly mulched ground (into cow manure in other words) are growing well. 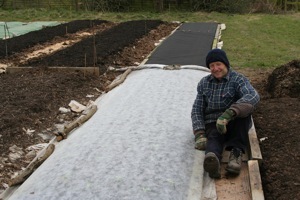 From now on I cover all new sowings and plantings with fleece laid flat on top of soil and plants. 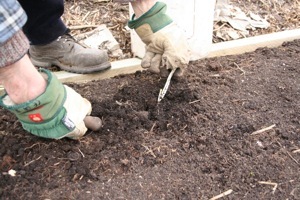 I don’t cover beds before sowing and planting, being unconvinced of the difference it makes, especially in undug soil with a thin layer of dark compost on top, which warms so readily without cover. Dark colours soak up solar warmth better than light colours. And fleece is white … but the reason it helps is to do with wind as much as anything, protecting leaves and giving them a chance to grow instead of being in self-defence mode as they use energy to resist being blown around and damaged. 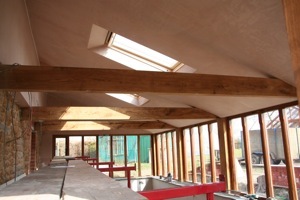 Also there is a greenhouse effect as fleece can hold onto warmth from the sun’s heating of soil, for longer than if wind is allowed to blow the warmth away. Add to this the protection given by fleece against pigeons, cats, rabbits and deer. 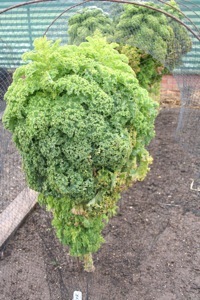 So any cover of fleece or cloche may make all the difference between success and failure in current conditions. The two outdoor hotbeds have been more worthwhile than in a normal spring. 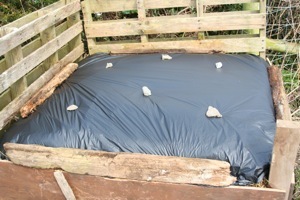 The deeper one has been working especially well and so far I am finding the fleece cloche on top to be more effective than the polythene lights, because of ease of use as much as anything, but it needs another month or two to be sure of that. HOTBEDS OUTSIDE late March, the deeper one is growing fastest (extra warmth) while these radish are ready to eat from a January sowing on the cooler. 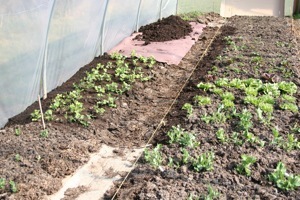 Using a cover means more success with April sowings such as peas of all types, more broad beans, parsnip, radish, spinach, beetroot, salad onion, lettuce, brassica plants and carrot, and if you have managed to raise plants in the cold weather it is good now for planting lettuce, onion, salad onion, beetroot, cabbage, calabrese, peas and sweet peas. Incidentally sweet peas do not mind frost at all. Yet hold off with seeds of courgette and squash, until mid month at the absolute earliest, and only if you have somewhere warm to grow the seedlings. 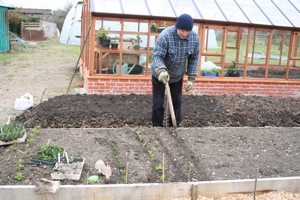 Runner and French beans want sowing even later, in May. 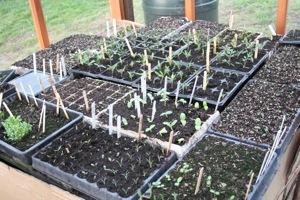 But tomato plants should be underway now and will probably need potting on in April. Mine are just putting on their first true leaves, about two weeks later than usual. The greenhouse hotbed has been giving gentle heat to seeds and seedlings, less intense than the heat from soil warming cables I used before, also from being filled in mid February it was much less warm by late March, from an average of low thirties to high teens centigrade, over about five weeks. 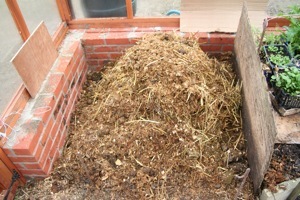 So… I removed the whole ten barrow loads of lukewarm manure from the greenhouse hotbed and put them in an old compost bin which I had discovered upon moving in here. 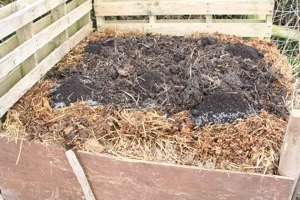 Its compost was full of polythene, nettle roots and wood, but otherwise good and I have used it in several beds as a bottom layer, so that its billions of weed seeds are well buried. 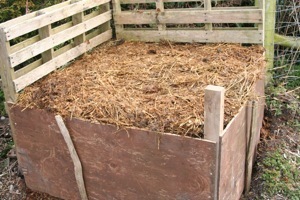 The four foot square bin is now full again of two month old horse manure from the greenhouse hotbed, and I have planted Estima (second early) potatoes on top of it, with some compost around them and then a mulch on top to retain heat and prevent greening of tubers. 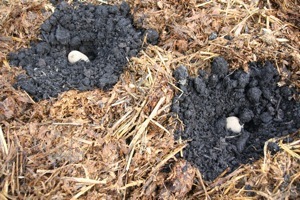 To see what difference it may make, because the young horse manure is not a rich medium for growth esp. 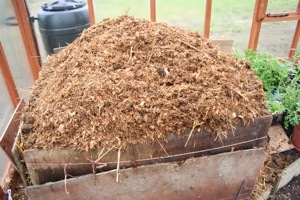 as it contains wood shavings. 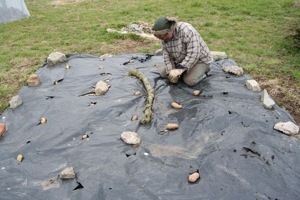 Finally some “biodegradable polythene” with stones to mark where the potatoes are planted so I can cut a hole in the surface mulches when they push through. 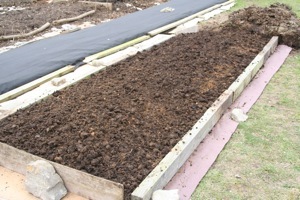 Refilling the greenhouse hotbed with fresh manure from Jenny’s huge heap. 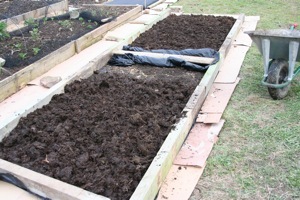 The final load needs spreading and squashing, then I put the pallet back and plants too. The fleece is only for frosty nights, just to be safe…. So now the greenhouse has a newly filled hot bed, from two trips of the car trailer to Jenny’s enormous heap over the road. Steph helped load and unload the trailer and it was all done in a morning, with a temperature initially of 20C rising one or two degrees per day, up to 31C by March 31st after five days in the heap. 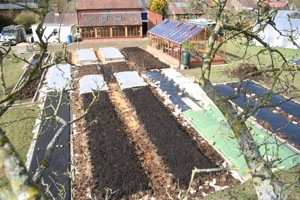 My season of making new and experimental beds is almost done, with the last two looking at mulching efficacy of biodegradable polythene and commercial paper mulch. 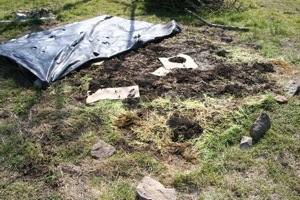 First I cut the grass out which was growing up this bed’s edge, then laid cardboard, then some biodegradable polythene. 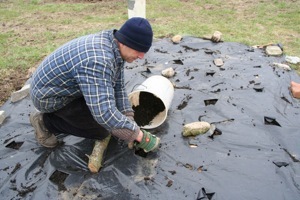 Wooden posts to hold it down in the wind before placing compost on top. starting from grass, buttercup, dandelion, some couch, cow parsley etc….. 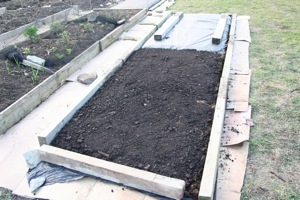 Filling the bed with old manure & sand, then levelled off, I want to grow winter carrots in this bed from a June sowing. 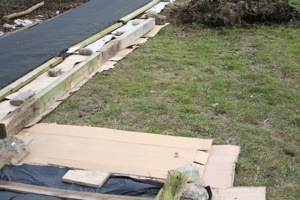 The wooden edges are not intended to be permanent, for now they are holding compost in until it settles and also they are useful for holding mulches in place on windy days when creating beds. 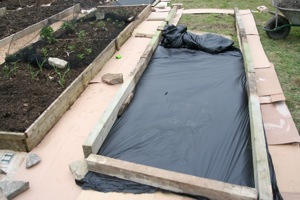 The bed on its left, covered with fabric, turned out to have quite a bit of buttercup growing happily under the landscape fabric….. we rolled some of it back on April 1st, weeded and planted lettuce, now under fleece. 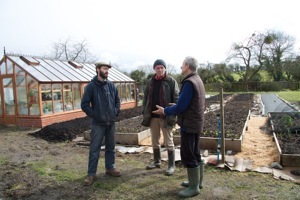 On 24th March, Steph and I visited Richard Sandford near Reading and saw his fascinating garden and impressive larder! Richard is a Michelin star chef who was diagnosed with prostate cancer four years ago and given two years to live, just after selling his restaurant and wine businesses. 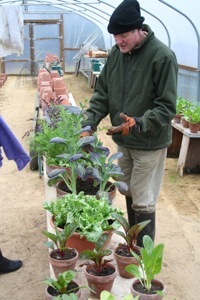 Friends advised him to travel and enjoy himself but Richard has sought fulfilment in gardening, cooking and healing. He was on Gardeners World with monty Don last September. Richard with salad for shoots only. 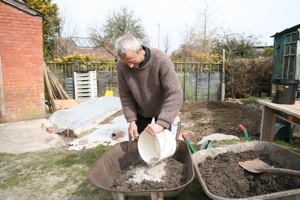 Richard is moving to no dig after incorporating sand and organic matter into his pudding-like clay. He wants best nutrition and a chemical free garden, hence the terracotta pots and wooden seed boxes. 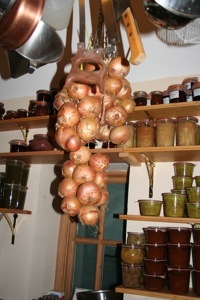 He gave us the most delicious breakfast of whole grains (spelt, barley) and sugar-free compotes of strawberry/rhubard, gooseberry and blackcurrant – also a preserve of courgette and mangetout pea which had stayed beautifully crisp in the jar, with oil and vinegar. 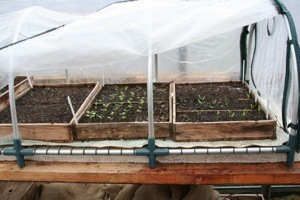 Home made propagator on a heat mat, in the tunnel. 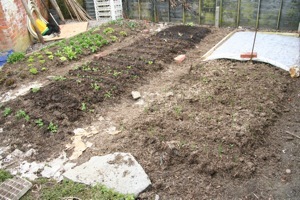 A view of the whole garden with (left) seaweed on the asparagus.